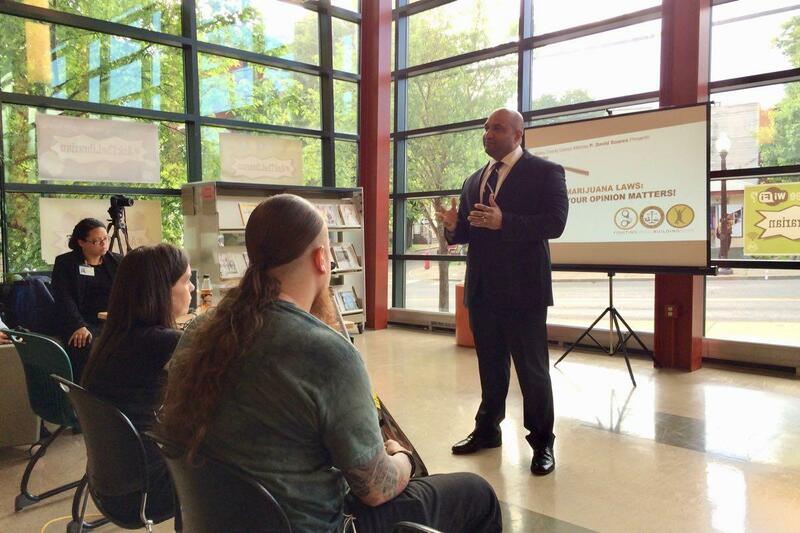 David Soares at a community meeting about marijuana policy at APL Arbor Hill branch this past summer. Albany County DA David Soares announced Thursday that his office will no longer be prosecuting people for "simple possession" of marijuana -- cases in which people are found to have less two ounces. The new policy starts December 1, and the DA's office says it will be seeking dismissals "where appropriate for cases currently pending where these are the sole charges." The new policy does not cover cases in which people are openly using pot in public or in a car, or near children. This policy has been developed after conducting a number of public meetings across the county in order to hear from the people we represent. In conjunction with the public meetings, we sought the opinion of residents via our website. The vast majority of our constituents indicated that they wanted to see a shift in the legal status of recreational adult use marijuana and in the enforcement of existing laws. Given the near certain impending changes in the law, and given the sea change in society's views of the issue, it is no longer the best use of our resources to prosecute these low-level marijuana offenses. Recreational marijuana use is now legal in Vermont. And Massachusetts is in the process of starting recreational marijuana sales. Here in New York, a Siena poll reported earlier this year that a majority of people favored allowing recreational marijuana. Cynthia Nixon made it a plank in her gubernatorial campaign. And a state Department of Health report released this past summer argued for legalizing recreational pot. It would not be surprising to see a move toward legalization of recreational marijuana in New York State now that Democrats will control both chambers of the state legislature. One of the important angles in the shift towards legalizing pot is the thousands of people who have been prosecuted in the past for something that is now being decriminalized or may even soon be legal. 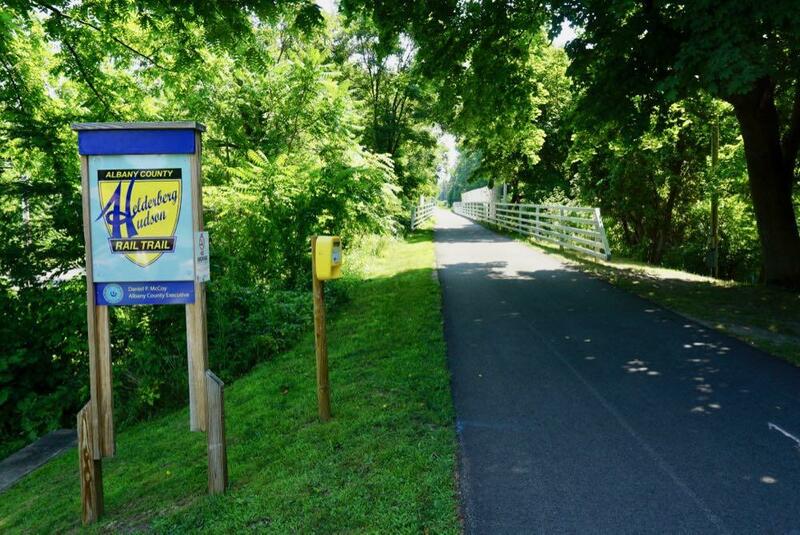 The second paved segment of the Helderberg Hudson Rail Trail -- from Slingerlands to Voorheesville -- is ribbon-cutting official as of this week. And the popular paved path now stretches 9 miles from Albany's South End to the west through Bethlehem and New Scotland. One of the things you might notice on the new segment -- it's hard to miss -- is the giant barn next to the spot where the rail trail crosses Hilton Road in the town of New Scotland. It is, appropriately, the Hilton Barn. It dates back 1898, and it's said to be one of largest post-and-beam structures ever built in the county. Multiple people we talked with about it this week described it as being like a cathedral. 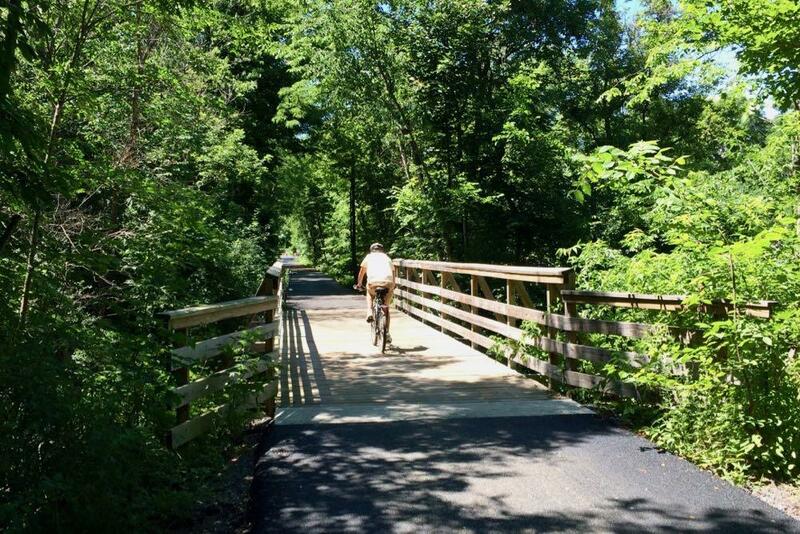 And its future could be a part of what you might think of as the second phase of the rail trail, in which destinations pop up along the trail and it branches out to connect with the surrounding communities. The second segment of Albany County's Helderberg-Hudson Rail Trail is now paved -- as noted earlier this week -- meaning there's now 9 miles of (almost) continuous pavement from the South End in Albany all the way out to Voorheesville. We got a chance this week to talk with Albany County exec Dan McCoy about the present and future of the popular trail. "I go around doing my state of the county every year, people are like rooting us on -- when's it going to be done, when's it going to be done, when are you going to fix the problem with it," McCoy said in reference to the remarkable popularity of the rail trail. "And these are good issues to have." 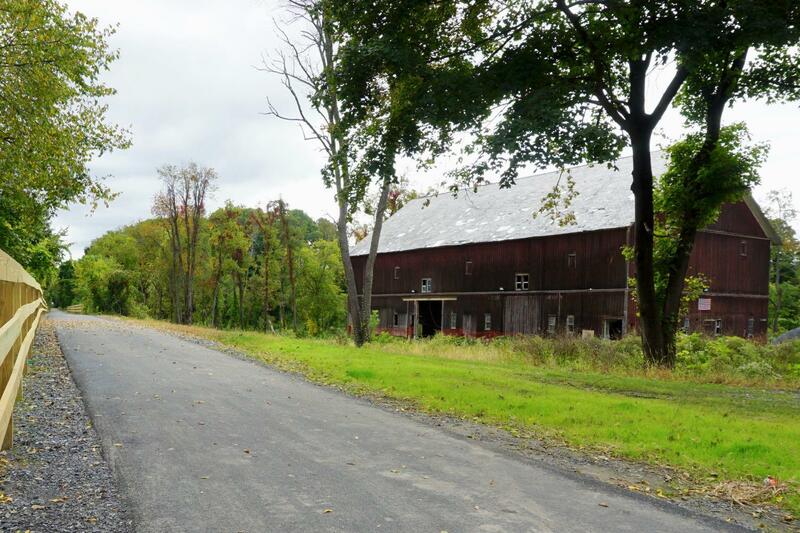 Check it out: The second segment of the Albany County's Helderberg-Hudson Rail Trail -- from Slingerlands to Voorheesville -- is now paved. We took a spin on the 4-mile segment this Saturday. The newly-paved section starts just west of the Slingerlands parking lot, crosses the Font Grove roads, slices through many shady sections alongside fields with views of the Helderbergs through the trees, passes the Hilton Barn in New Scotland, spans State Farm Road, traverses the Vly Creek, and ends at Grove Street in Voorheesville. The pavement is luxuriously smooth. That makes (almost) nine miles of continues paved trail from South Pearl Street in the city of Albany out through Bethlehem, New Scotland, and Voorheesville. 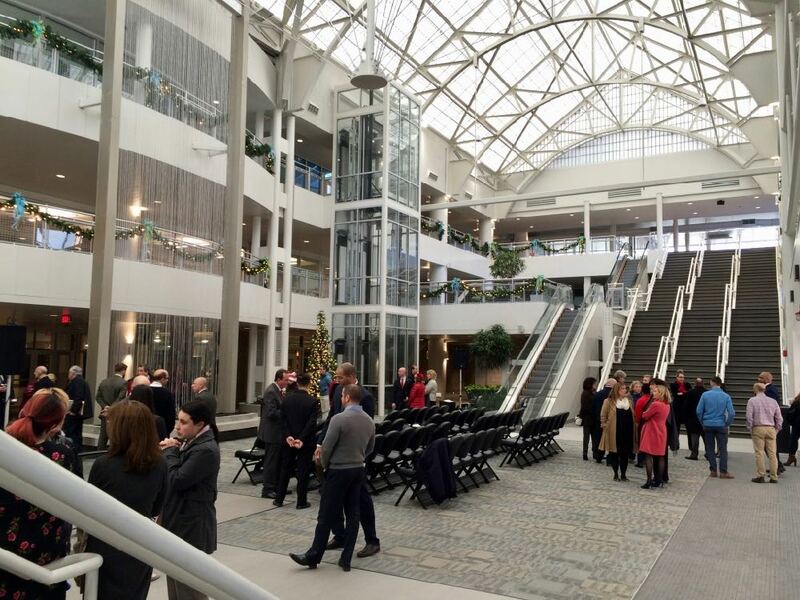 The makeover of the Times Union Center's Pearl Street exterior and atrium is finished. The almost-$20 million project included a new facade with huge video boards on the outside the county-owned arena. On the inside, the atrium was enclosed to make it usable during all four seasons (the space hosted a county tree lighting on Wednesday). It also expanded the mezzanine space, and reconfigured the stairs and escalators. Plus: There's a large falling water feature. In this workshop Virgina Rawlins, our Housing Counselor, will walk you through your application and answer any questions. This workshop is important to all who are interested in purchasing a property from the Land Bank and for those who are considering purchasing a property; every individual will go through the same process. The land bank website displays available properties in both list and map form. And here's a map of land bank properties in their various states -- from evaluation in progress to sold. 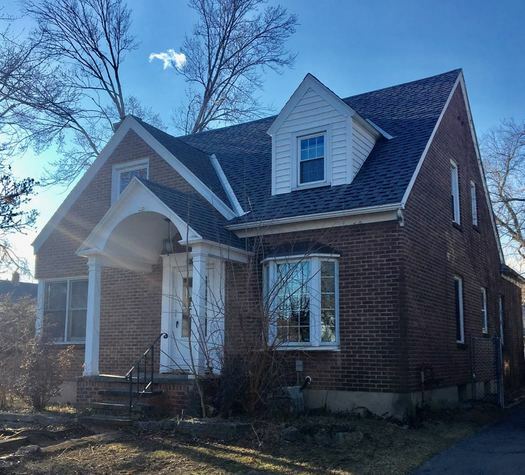 Many of the properties are in the city of Albany, but others are spread around the county. The Albany County Land Bank website currently lists about 20 available properties, both buildings and vacant lots. But there are lot of properties in the pipeline -- the land bank recently announced it had acquired 265 properties in the city of Albany. Land banks are a relatively new concept. The idea is that they serve as a bridge between when a vacant property is seized in tax foreclosure and when it's bought by a new owner for renovation and/or redevelopment. Land banks acquire the properties, stabilize them, and then market them for sale with the aim of finding buyers will redevelop them responsibly. The orgs can also "bank" properties (thus the name) to group them or otherwise set them up for better chances of successful development. The Capital Region has three land banks: Albany County Land Bank, Troy Community Land Bank, and Capital Region Land Bank (Schenectady and Amsterdam). A rendering of the design for the interior. 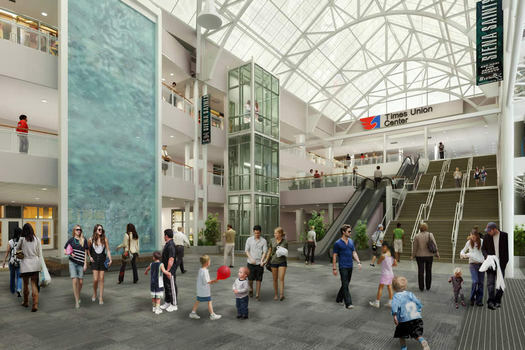 The renovation of the atrium of the Times Union Center officially started Wednesday. (There was a ceremonial sledgehammering of some concrete steps.) Maybe you've noticed the construction work -- and the narrowing of Pearl Street -- there recently. That's what the activity's been about. The $19.6 million project will enclose the atrium along Pearl Street to make it usable for events all four seasons, expand the mezzanine space, reconfigure the stairs and escalators, and upgrade the bathrooms. Also: The design includes a large vertical sheet of falling water and new digital billboards on the exterior. The north side of the atrium is currently the focus of the construction work. The plan is to have it ready by next spring, along with the new streetscape, and then switch the focus to the south side. The arena will be open during the work. The renovation is part of the larger overall plan to connect the Empire State Plaza, the new Albany Capital Center on Eagle Street, and the TU Center into a chain of spaces that can be used for events both small and very large (the NCAA men's basketball tournament, for example). The convention center is scheduled to be ready in March of next year, and the walkway connecting all three venues will also be enclosed by then. 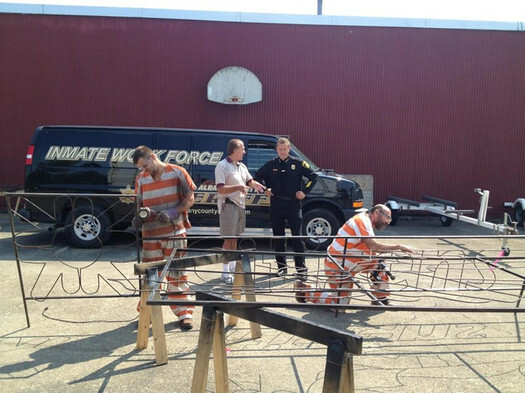 Albany County Jail inmates assembling a display for the Capital Holiday Lights in Park in Washington Park. A few weeks ago we got an email from Laura, who noticed that inmates from the Albany County Jail were putting up the holiday light display in Washington Park. "I suppose there are many points of view on prisoners working," she wrote, "but it looks like chain gang labor to me." We've noticed prisoners working on other projects throughout the county, too. And Laura's note got us curious about what kind of jobs they're doing and how the program works. The totals were released to mark one year since the state law making TWD a primary traffic offense took effect. That means police can now pull a person over just for that -- before you had to be doing something else to get stopped (like swerving over the double yellow because you were sending email). And it looks like people are getting pulled over for it. All county totals after the jump, if you're curious. Tuesday was, of course, Election Day -- and for the third time in 12 years, I did not vote. The first time I didn't vote was 1999. I turned 18 on October 3, was a freshman in college and was overwhelmed and misinformed about where to vote. The second time was in 2003. I had just moved to a new town and registered when changing my drivers license. The registration was never processed. But this year, my absence from the polls was an active choice. A clip from the reconfigured system map. A larger version is embedded after the jump. Improved Trunk Routes -- CDTA trunk routes operate seven (7) days a week, from early morning until late night. Customers using Routes #6, #7, #12, & #18 will see increased frequency, later night and New Sunday service and consistent trip patterns with no deviations. 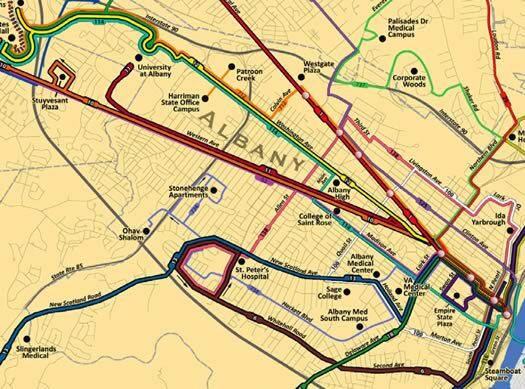 Improved Commuter Routes -- Provide more direct, peak period connections throughout Albany County to customer-requested locations including Albany International Airport, Corporate Woods, Harriman State Campus, Ohav Shalom and Stonehenge Apartment Complexes along with Patroon Creek Boulevard. You might have noticed the blue bags over route signs along the road -- this is what those are about. Here's a listing of the new schedules. A map of the restructured routes is embedded after the jump. CDTA says routes in Albany County represent "well over 50%" of its ridership. So this is a big deal. Even more so if it actually makes the system more useful to people. Someone's else's name here. Please. 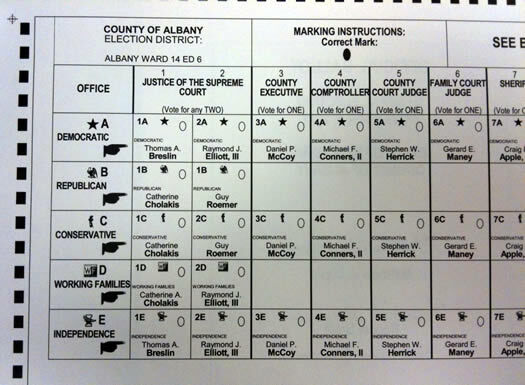 Standing at the voting booth today, looking at all the unopposed races, we thought: Albany needs a better opposition party -- whether it's Republicans, Greens, Technocrats, the Party Party. 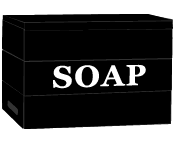 Something, anything to make the Democrats at least have to earn it. You know, there's a small mischievous thrill from voting "none of the above" as a write-in, but it doesn't really help anything. And voting for voting's sake is hollow. Light and fresh -- at 1740 calories. We have seen the future of restaurant menus in Albany County. And it's kind of depressing. We understand that there's a car under there -- somewhere. Greg sent along a gallery of photos from the "snowpocalypse" out in Westerlo. 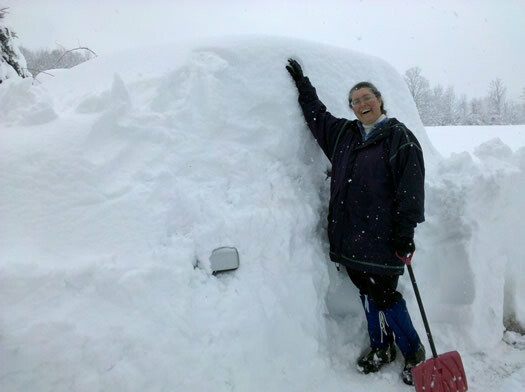 He says he spent the weekend "helping my girlfriend's family dig out from the insane amount of snow that got dumped on them." Insane is the right word. While the central Capital Region just got slushy rain toward the end of last week, the snow just kept falling in western Albany County. An observation station to the west of Thacher Park recorded snow depths of more than 3.5 feet by the end of last week. There's a few pictures of us excavating her brothers car, and some shots of the abandoned barn that collapsed across the street (no cows were hurt). The first picture is of Hartford, CT the same day as I drove back from a work trip. Other places weren't so lucky -- CBS6 reported that farm animals were killed in two separate barn collapses this past weekend in the hill towns. 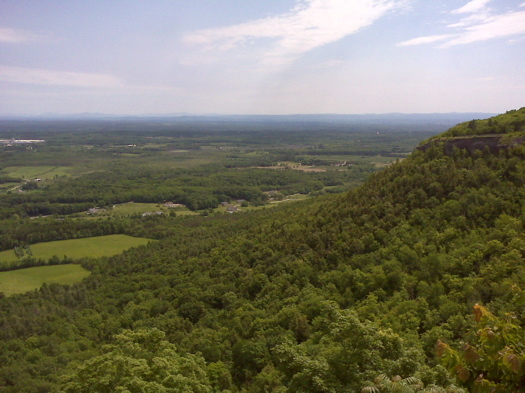 The view from the Indian Ladder Trail in Thacher Park. John Boyd Thacher State Park -- and the Victoria Pool at Spa State Park -- might be closed because of state budget cuts. Or they might not. It's hard to say, because there's been no public declaration by the state that Thacher and other state parks are facing the budget axe. But the signs seem to be pointing in that direction. How many calories does that cost? It's hard to tell in the pic, but the counts are right next to the prices. 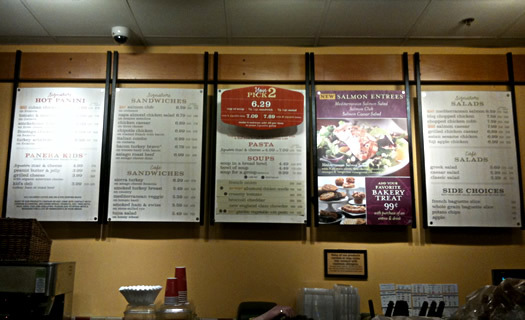 Fred emailed this week that the Panera on Washington Ave Ext has new menu boards up -- and they include calorie counts for all the items. This is the first example we've seen locally of this kind of menu board tagging. It will soon be required of all chain restaurants in Albany County because of a bill that was passed last fall. The aim of the bill is to help people make healthier food choices. New York City already has a similar measure in effect. The research on whether the calorie counts actually affect people's behavior is unclear. A study that looked at the question shortly after the law took effect found little change. A more recent study suggested the counts may have prompted people to consume fewer calories at Starbucks. By the way: a recent study published in the Journal of the American Dietetic Association reported that many of the restaurant calorie counts it studied were... wrong. Albany County and, for the first time, Rensselaer County have free H1N1 flu shot clinics coming up. Both counties are only offering the shots to residents in priority groups. Pre-registration is required. Update: The Albany County clinic is now full. 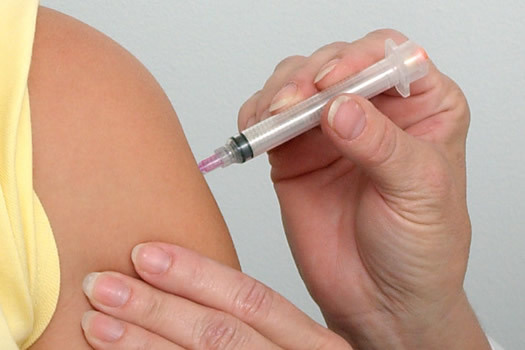 Both Albany County and Schenectady County have free H1N1 flu shot clinics coming up. Both counties' clinics are only open to county residents. people over age 4 who live with or provide care for infants younger than 6 months of age, health care and emergency medical personnel, people aged 4-24 years and people aged 25 to 64 years who have medical conditions that put them at higher risk for influenza-related complications. The county says it doesn't have pediatric vaccine available for kids 6 months to 47 months. Nov 20 and 23 - Schenectady County offices at 107 Nott Terrace in Schenectady. The clinics will be open to the same priority groups as Albany County, plus children 6 months to pre-k.
You'll need an appointment -- call 386-2824. Also: If you can't make it to one of the clinics -- or you live in Saratoga County or Rensselaer County -- give your doctor's office a call. New vaccine shipments have apparently been gradually arriving. Rensselaer County's web site says it does not plan to hold H1N1 flu shot clinics. 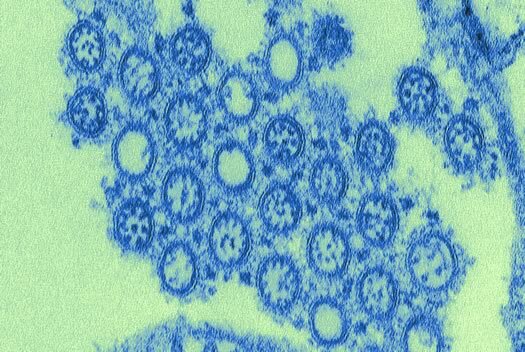 An electron micrograph of H1N1 virions. The image has been colorized. The Albany County Department of Health is holding a free H1N1 flu shot clinic at the TU Center this Sunday. Apparently there will be about 4,500 doses available. You can register online (be sure to follow the link for the appropriate priority group) -- or by calling 447-4505 from 8:30 am - 4:30 pm (Arielle says she registered her toddler this way this morning). Turnout at other H1N1 vaccine clinics around the Capital Region has been strong, so it's probably a good idea to register sooner rather than later. Saratoga County: Saratoga County Public Health has an H1N1 flu shot clinic for priority scheduled for tomorrow in Saratoga Springs. It's by appointment only, though. And when we checked this morning (after a three dials to get through), it was full. The person handling the calls said the county is hoping it will receive more doses next week. Back in August the Albany County legislature passed a law that requires chain restaurants to post calorie counts on menus. The legislation is based on a similar measure in New York City. The aim of both laws: help people make healthier choices. We examined the influence of menu calorie labels on fast food choices in the wake of New York City's labeling mandate. Receipts and survey responses were collected from 1,156 adults at fast-food restaurants in low-income, minority New York communities. 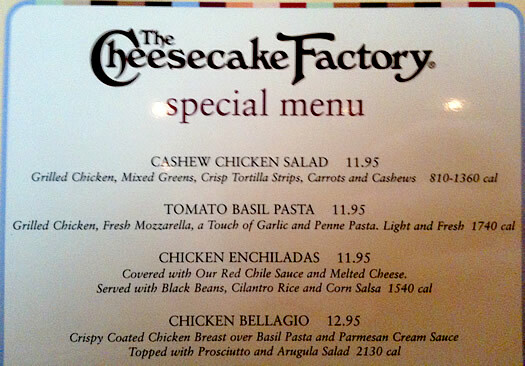 These were compared to a sample in Newark, New Jersey, a city that had not introduced menu labeling. We found that 27.7 percent who saw calorie labeling in New York said the information influenced their choices. However, we did not detect a change in calories purchased after the introduction of calorie labeling. As the abstract indicates, the study only looked at low-income communities -- and health advocates are already responding that the law might have more effect where people aren't as price sensitive. Albany County's calorie count law takes effect early next year. It's opening day at The Track. Racing starts at 1 pm. On tweeting while driving. And eating babies. Tweeting a response to @B_Nut got me pulled over [on Wolf Road]. 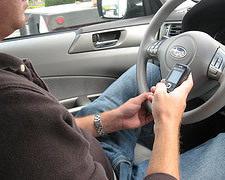 Telling the officer "I wasn't texting. I was Tweeting." is not recommended. The site of last night's earthquake -- well, here, but 9 km down. There was another earthquake last night near Berne -- and it was relatively big (for this area). The seismographic network that monitors this area reports that quake was a 3 on the magnitude scale ("felt quite noticeably by persons indoors, especially on upper floors of buildings"). There are reports that people did feel this one. Things have been a little shaky in the Hill Towns recently. Over just the last three months there have been 14 earthquakes. Most of them have been tiny. The one last night was the strongest of the group. There's an interactive map after the jump.